Jamie Welch | The Gettysburgian. In the 21st episode and season one finale of On Target, Pontz and Welch discuss the news of the past month, including the revocation of a degree and the departure of a president. Then, Gettysburgian Co-Sports Editors Elizabeth Hilfrank and Claire Healey sit down with head swimming coach Mike Rawleigh and Pontz and Welch talk to DPS Officer Ricky Pearce. Plus: Pontz delivers the Bullet Report and Welch bids farewell to On Target and The Gettysburgian. 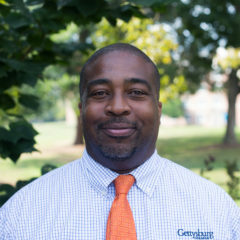 Jamie Welch sits down with Senior Associate Director of Admissions Darryl Jones for a wide-ranging interview including his background, the application review process, and some reflection on efforts to build more diversity at Gettysburg College. Extracted from the April 8, 2018 episode of On Target.